Working capital is the difference between a company’s current assetsCurrent AssetsCurrent assets are all assets that can be reasonably converted to cash within one year. They are commonly used to measure the liquidity of a company. A company’s assets on its balance sheet are split into two categories – current assets and non-current assets (long-term or capital assets). and current liabilitiesCurrent LiabilitiesCurrent liabilities are financial obligations of a business entity that are due and payable within a year. A company shows these on the balance sheet. A liability occurs when a company has undergone a transaction that has generated an expectation for a future outflow of cash or other economic resources.. It is a financial measure, which calculates whether a company has enough liquid assets to pay its bills that will be due in a year. When a company has excess current assets, that amount can then be used to spend on its day-to-day operations. Current assetsCurrent AssetsCurrent assets are all assets that can be reasonably converted to cash within one year. They are commonly used to measure the liquidity of a company. 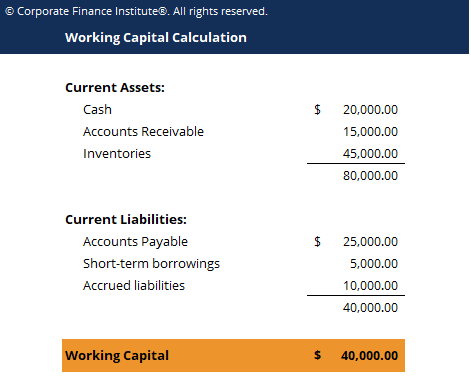 A company’s assets on its balance sheet are split into two categories – current assets and non-current assets (long-term or capital assets)., such as cash and equivalentsCash EquivalentsCash and cash equivalents are the most liquid of all assets on the balance sheet. Cash equivalents include money market securities, Bankers Acceptances, Treasury bills, commercial paper, and other money market instruments., inventory, accounts receivableAccounts ReceivableAccounts Receivable (AR) represents the credit sales of a business, which are not yet fully paid by its customers, a current asset on the balance sheet. Companies allow their clients to pay at a reasonable, extended period of time, provided that the terms are agreed upon. and marketable securitiesMarketable SecuritiesMarketable securities are unrestricted short-term financial instruments that are issued either for equity securities or for debt securities of a publicly listed company. The issuing company creates these instruments for the express purpose of raising funds to further finance business activities and expansion., are resources a company owns that can be used up or converted into cash within a year. Current liabilitiesCurrent LiabilitiesCurrent liabilities are financial obligations of a business entity that are due and payable within a year. A company shows these on the balance sheet. A liability occurs when a company has undergone a transaction that has generated an expectation for a future outflow of cash or other economic resources. are the amount of money a company owes such as accounts payable, short-term loans and accrued expensesAccrued ExpensesAccrued expenses are expenses that are recognized even though cash has not been paid. These expenses are usually paired up against revenue via the the matching principle from GAAP (generally accepted accounting principles). For those who are unaware of the matching principle, which are due for payment within a year.